Malin’s Mushrooms with Shallots in a Balsamic Reduction give a sweet-tart contrast to the creamy, sharp goat cheese in these easy, elegant warm appetizers. Preheat oven to 375 degrees. 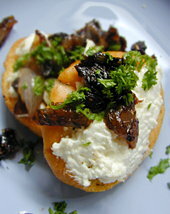 Spread about a tablespoon of goat cheese on each crostini. Place them on a cookie sheet and bake while you make the reduction. Sauté the shallots in the butter for three minutes. Add the mushrooms and brown sugar, stirring for one minute. Add the thyme, salt and pepper and the balsamic vinegar. Allow to boil vigorously for 4 minutes, stirring constantly. Remove crostini from oven. Top each with about a teaspoon of mushroom-shallot mixture, drizzling any extra sauce over them. Garnish with chopped parsley and serve. This entry was posted on Wednesday, September 5th, 2007 at 11:06 am	and is filed under Master Recipe Index, Side Dishes, Speed Queen (30 min/less), Vegetarian. You can follow any responses to this entry through the RSS 2.0 feed. You can leave a response, or trackback from your own site.